Olympus converges its latest advancements in high-performance digital circuitry and eddy current flaw detection into one compact and durable portable unit—the new NORTEC® 600. With its crisp and vivid 5.7 inch VGA display and true full-screen mode, the NORTEC 600 is capable of producing highly visible and contrasting eddy current signals in any lighting condition. The NORTEC® 600 is available in four versatile instrument models to meet the widest range of inspection needs. From the basic model upward, each unit unlocks more features. For maximum convenience, additional features can also be unlocked remotely. *One conductivity probe 9222340 [U8690027], standard 9522103 [U8880111] and calibration shims 0320806 [U8840160] included. All models of the NORTEC 600 come with the standard LEMO 16-way universal connector, as well as a BNC connector for absolute probes. Simply select the connector in the instrument interface. When reading from the BNC connector, the instrument features automatic internal balancing for hassle-free operation. The 16-way LEMO connector also supports the PowerLink NORTEC technology, which features automatic probe recognition and instrument presets for quicker setups. To simplify inspection, the NORTEC 600 includes all the legacy modes and layouts used in existing NORTEC-specified procedures, as well as those used by many other equipment manufacturers. Standard impedance plane view, sweep mode (strip chart), split screens, adjustable null point, crosshairs, improved filter response, reference signal display, and several other useful features are all part of the NORTEC 600 package. Offering compatibility with many other probe and rotary scanner manufacturers, the NORTEC 600’s accessories include cables and adaptors such as a 12-way LEMO, an 11-way Fischer, and more. The proper adaptor or scanner cable make it possible to benefit from all the outstanding capabilities of the NORTEC 600, without investing heavily in probes and accessories. The NORTEC® 600 has one of the most brilliant displays available on the portable eddy current flaw detector market. 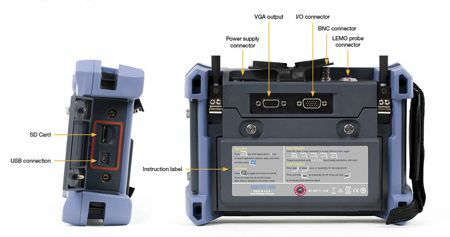 The unique brightness, resolution, and definition of its 5.7 inch VGA display makes it possible to interpret eddy current signals at a distance. The user-selectable color schemes ensure that the display is equally clear and easy-to-read whether you are using the NORTEC 600 indoors or outside. In addition to impressive size and brightness, the NORTEC 600’s VGA display also features a new full-screen mode that can be activated at the touch of a key. Available for all applications and in all display modes, the full-screen mode really comes in handy when reading signals over an extended period of time. split screen (sweep + impedance). all-in-one display featuring up to 3 configurable traces. The NORTEC® 600 merges seamlessly into any integrated eddy current detection system. 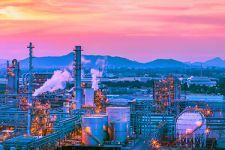 Its numerous software and hardware features ensure that the instrument is capable of performing consistent flaw detection in industrial environments. The NORTEC 600 specifications and functionalities were designed with the integrator in mind. -10°C to 50°C operating temperature range. Strip chart view with sweep alarm. Remote Control from NORTEC PC. When developing the NORTEC® 600's user interface, Olympus wanted to create the best possible combination of simplicity, efficiency, and intuitiveness. The result is a totally redesigned navigation system that significantly reduces the learning curve, all while maintaining a high level of productivity during inspection, even for novice operators. All the benefits of this newly redesigned user interface are available in more than 15 languages. To meet customers’ needs, the NORTEC 600’s new carefully designed Application Selection menu contains predefined factory settings that save time during signal calibration. The instrument also features a new All-Settings page that displays all of the parameters on the screen at once, so that you can quickly configure the instrument to conform to a particular procedure. This new and innovative feature of the NORTEC 600 allows operators to focus their attention on the movement of the probe to ensure that they achieve a satisfactory scan. Afterward, the gain and angle can be adjusted while the signal is in Freeze mode. A single press of the new SAVE key instantly stores the current settings (program) and signals (data) in the instrument’s memory, together in a single file for maximum convenience and user-friendliness. The capture function can also be delayed to allow correct hand positioning and a proper scanning motion before the unit actually begins recording. The on-board memory features room for 500 files, which can be transferred to another unit or a computer as needed. Background reference signals can also be recalled from the memory in a new, faster way: simply press and hold the SAVE key while live signals are displayed on the screen to send those same signals to the background. The new File Manager menu of the NORTEC® 600 has been completely streamlined – without sacrificing convenience or productivity. It features a new file preview function that allows browsing through the different files in a very visual way. Once the proper file is found, it can be recalled at the user’s convenience. The File Manager menu also permits editing, overwriting and deleting any file with a minimum number of operations. The on-board Text Editor comes in handy for editing file names, user and instrument information, or simply adding notes while still on site. Anytime during inspection, recorded indications can be viewed with the new PC software, NORTEC® PC. The NORTEC PC software allows for the easy exchange of files between the NORTEC 600 instrument and your computer. Communication is established via a USB cable, and all files can be quickly downloaded or uploaded. Once files are on the computer, they can be viewed, copied to clipboard, or exported as a PDF report. NORTEC PC also features a new, “PDF ALL” function that generates an entire inspection report with a single click, making archiving very easy. 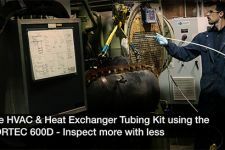 Tube testing is faster and easier with the NORTEC 600D flaw detector and the HVAC and heat exchange tube adaptor kit. This kit enables the user to inspect any combination of ferrous, non-ferrous, finned, or un-finned tubes thanks to the multiple technologies supported: eddy current bobbin probes, eddy current pancake coils, remote field inspection, and near field inspection. The NORTEC® 600 flaw detector offers outstanding performance for aerospace applications. 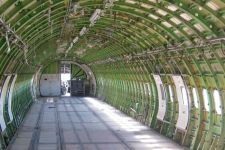 Quickly and easily conduct surface inspections, wheel inspections, and bolt-hole inspections. The rotating plastic scanner probes section features a variety of expandable plastic-tip probes and stainless-steel backshell probes, including the SUB series, SPO-5965 series, SPO-3564 series, and standard series. Manual bolt hole probe coils are positioned at right angles to the shaft direction. These probes are rotated by hand to inspect holes with the fasteners removed. Standard (fractional and metric) and custom diameters are available with either absolute or differential coils. Spot probes are used for discovering flaws both on and below surfaces. Their large coil diameter and low frequency operation are advantageous for scanning larger areas, and providing an increased detectable flaw size; typically equal to one-half of the probe diameter. Weld probes are designed to inspect ferrous welds. 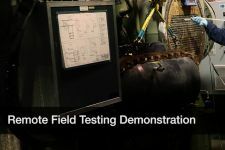 They provide a cost effective alternative to magnetic particle inspection, which requires the part to be prepared (cleaned) prior to inspection. Sliding probes are specifically designed to inspect rows of fasteners. They operate in reflection mode and are used to find surface and near-surface flaws. They come in adjustable types, which are able to accommodate different fastener sizes, and fixed types, which are usually procedure specific. Conductivity probes are designed for sorting non-ferrous metals and determining heat treatment condition or damage. 90° tip, stainless-steel shaft. Designed for general surface crack detection, these probes are available in a variety of lengths, and with various coil configurations, drops, and connector options. Straight stainless-steel shaft. Designed for general surface crack detection, these probes are available in a variety of lengths, and with various coil configurations and connector options. 30° or 45° tip, stainless-steel shaft. Designed for general surface-crack detection, these probes are available in a variety of lengths, and with various coil configurations, drops, and connector options. Flexible copper shaft of these probes can be bent to various shapes. Designed for general surface crack detection, flexible surface probes are available in a variety of lengths, and with various coil configurations, drops, and connector options. Bent shaft surface probes are general purpose stainless-steel probes used for surface or near-surface crack detection. They are available in a variety of sizes, and with various coil configurations and connector options. Pencil surface probes are general purpose plastic-tip probes used for surface or near-surface crack detection. They are available with various coil configuration and connector options. Pencil surface probes feature an adjustable collar for greater stability. A specialized probe series including the Pencil 3551l probe, Blade probe, Plastic-Tip probe, Finger probe, and Spring Loaded probe. The rotating stainless steel scanner probes section includes a range of all-stainless-steel probes, including the standard series and the SEU series. The other rotating scanner probes section includes a variety of specialized scanner probes, such as the Adjustable X type series, the Adjustable Y type series, the Countersink series, and the Countersink Stainless Steel series. Ring/Donut probes are made to fit various fastener head diameters. 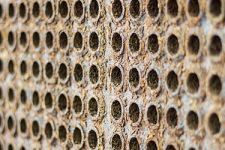 Their principal use is for subsurface crack detection with the fastener in place. They are available in both bridge and reflection configurations. Olympus manufactures high quality cables and adaptors to fit with all eddy current probe models. Reference standards should be used in every application and are available in many configurations and materials. 1.7 kg, including lithium-ion battery. EN-15548, CE, WEEE, FCC (USA), IC (Canada), RoHS (China), RCM (Australia and New Zealand). AC Mains: 100 VAC to 120 VAC, 200 VAC to 240 VAC, 50 Hz to 60 Hz. One USB 2.0 peripheral port, one standard VGA analog output port, one 15-pin I/O port (male) with 6 analog outputs, 3 alarm outputs. 0°C to 50°C (with batteries) and -20°C to 70°C (without batteries). Designed to meet requirements of IP66. Single lithium-ion rechargeable battery or optional AA-size alkaline batteries (in 8-cell holder). Up to 10 hours for standard operation; 6 hours to 8 hours when operating rotary scanners. Normal or Full screen, 8 color schemes. Choice of 5 grids; crosshairs (single trace displays only). NORTEC PC software, included in base NORTEC 600 kit. NORTEC PC allows viewing saved files and printing reports. 500 traces of 120 s max featuring user-selectable on-board preview. Application Selection menu for easy and rapid configuration. Automatic lift-off key. Choice of up to 2 real-time readings measuring signal characteristics (selection of 5 amplitude measurements and 1 angle measurement). Absolute and differential in either bridge or reflection configuration. The instrument is fully compatible with NORTEC PowerLink probes, as well as other main probe and accessory suppliers. 16-pin LEMO and BNC featuring internal automatic balancing for BNC connector (absolute probes). 0 dB to 100 dB in 0.1 or 1 dB increments. 0° to 359.9° in 0.1° or 1° increments. (total of 13.3 divisions with FINE grid). Low-pass: 10 Hz to 2000 Hz and wide band. High-pass: off or 5 Hz to 1000 Hz, user-selectable in constant “figure 6” or “figure 8” filter type. Continuous null (low-frequency HP filter): 0.2 Hz, 0.5 Hz, 1.0 Hz. LOW, MEDIUM, and HIGH (2 V, 5 V, 8 V). 3 simultaneous alarms. Choices include BOX (rectangle), POLAR (circle), SECTOR (pie), SWEEP (time-based), CONDUCTIVITY, and COATING THICKNESS. Digital conductivity display from 0.9% to 110% IACS or 0.5 to 64 MS/m. Accuracy within ±0.5% IACS from 0.9% to 65% IACS and within ±1.0% of values over 62%. Meets or exceeds BAC 5651 specifications. Can measure non-conductive coating thickness from 0 mm to 0.648 mm. Accuracy of 0.025 mm (±0.001 in.) over a 0 mm to 0.64 mm range. Operates Olympus scanners (MiniMite, SpitFire, RA-2000, and PS-5) and other major supplier scanners, from 120 RPM to 3000 RPM. Two fully independent frequencies, operating in simultaneous injection. F1 - F2, F1 + F2, and automatic true mixing. 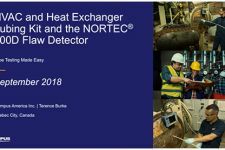 If you work in explosive atmospheres, the NORTEC 600 Ex flaw detector conforms to the requirements of the ATEX directive. For more information, read our FAQ on the ATEX directive. Model: Basic, Conductivity (C), Scanner (S), and Dual Frequency (D). Items included in all NORTEC 600 models*: NORTEC 600 instrument with factory-installed hand strap, getting started manual, factory certificate, rigid transport case, DC charger with power cord, Li-Ion battery, AA battery tray, USB communication cable, MicroSD memory card and adaptor, and NORTEC PC software and product manuals disc. *Standard inclusions may vary depending on your location. Contact your local distributor. Additional items included in NORTEC 600C model only: 19 mm, 60 kHz conductivity probe, conductivity calibration standard (set of 2: 29% and 59%), and calibration shims.